The 35th anniversary of Gene Vincent's, the "Be Bop A Lula"cat, sad passing brings us an essential record titled "Rare & Unreleased Recording 1963 - '71" on Virginia Records. Only 500 copies of this essential record were issued and they will go fast to every Gene's fan collection. This record shows us Gene Vincent in the second part of his career from 1963 to 1971. So don't be surprised to find many rare European recordings from the start to the end. The record starts with "She She Little Sheila" and "Suzie Q", the classic Dale Hawkins song, recorded in 1963. Next his never issued concert of "Gégéne" (Gene's French nickname) in Lyon (France) complete with afternoon rehearsals. Recorded on 28th September 1967, it showcase Gene at work with The Rock'n'Roll gang, a French band, and how humble he was. He even apologizes to them for goin' wrong in the rehearsals of "Say Mama". The show brings over 1000 customers that night and showed us Gene rockin' hard on classic songs as "Long Tall Sally" or "I'm Goin' Home". Pure frantic R'n'R with great sound recorded in his last long French tour. Gene would be back in 1969 and 1970 but only for a short time. Following a message for his English fans and an interview done for a Swiss radio on 06th October 1967. Gene had to answer to very amateurish broadcasters but goes fine. Those questions are often silly but Gene goes straight with it telling them about what mean Rhythm and Blues for a Southerner and how Carl Perkins rocked the world before Elvis. Gene will later record on his last LP a cover version of "Boppin' the Blues", a Carl Perkins classic song from the "Sun" area. You can't find that interview on any other record so if you want to hear Gene soft voice goes ahead on with that CD. Another highlight is the Dave Lee Travis BBC Radio show taped in London on 16th November 1969. On those four live recording Gene is backed by the Wild Angels, a British band. Here Gene gives a full rockin' treatment to the classic Al Dexter's "Pistol Packin' Mama" and to "Rocky Road Blues". He was back on his country roots with those old songs already recorded for "Capitol" with his Blue Caps in the 50's. Next, are three recordings done at the San Franscico State College on September 1970 with Commander Cody Band. "Sunshine" and "N°9 (Lonesome Whistle), recorded for Dandelion and Kama Sutra, showcase Gene's sweet voice. The main surprise came with "Woman Love", a 1956 song, done on the Commander Cody demand. Those guys wanted rock some, even if billed on Folk festival, and Gene found his way on "Whole Lotta Shakin', "Maybellene" and Be Bop A Lula". Those three last tracks are not on the CD but can be find on an old Magnum Force LP titled "From L.A. to Frisco" issued in England in the 80's. "Sunshine" is a Mickey Newbury song. Mickey is also the composer of "How I Love Them Old Songs" for Gene Vincent and of "An American Trilogy" who would become an Elvis Presley's classic in the 70's. "The Day the World Turned Blue" was recorded on 25th January 1971 for BBC radio in London. Written by Gene that song borrows the shade of Buddy Holly and was on Gene's last LP for Kama Sutra. Here Gene is backed by the Houseshakers, a British band, and found again his "Screaming End". Great performance! Last track of the CD is "Distant Drums" recorded shortly before his death, on 1st October 1971, for the BBC radio. That classic Roy Orbison/Jim Reeves song comes fine and Gene even put his girlfriend name here. The other rockin' songs recorded that day are not on the CD but can be easily found. On 8th October 1971, a week later, Gene will leave England for the last time and will find the end of his "Rocky Road Life". He will die on 12 October 1971 from a bleeding ulcer. The CD comes with a beautiful booklet and many nice pictures of Gene on and off stage. You can find that record at transalpinus1@yahoo.com for a nice price. 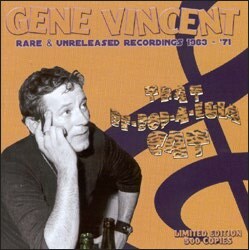 The CD offers 29 rare recordings and goes along perfectly with Steven Mandich's great book "Sweet Gene Vincent ­ The Bitter End" published in 2002. Brest R'n'R Appreciation Society ­ France.